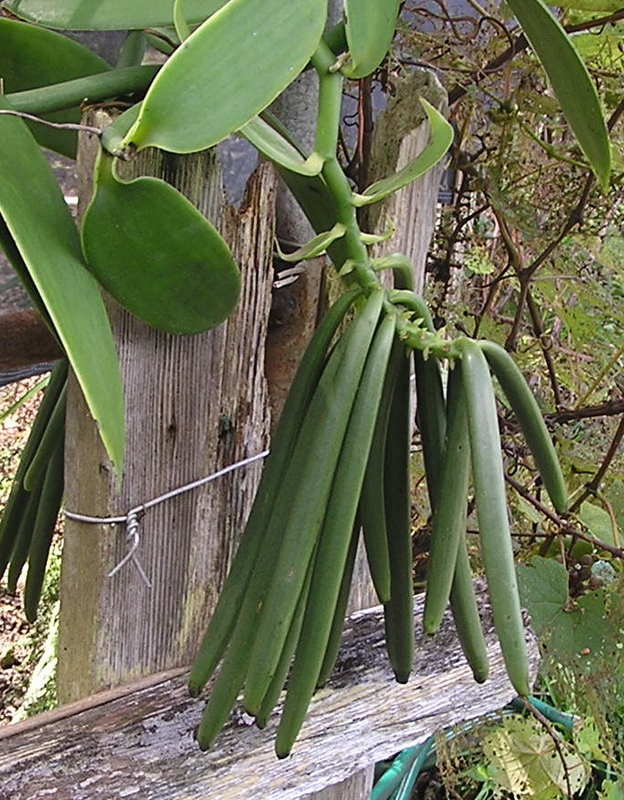 A reader shares this great report on two vanilla plantation visits on Hawaii‘s Big Island: the Hawaiian Vanilla Company, and Huahua Farm. Clare was a very gracious and sharing host while we visited her farm. She has a number of vines, but recently had to destroy some plants due to a disease of some kind. The vines that remain are healthy and doing well. I believe some of the photos you have on your site show the trellises she uses to train the vines where to grow. They are under about a 50% shade cloth. At the time of our visit, there weren’t any flowers, but Clare said that they typically start to appear in January for her. She did have some nice looking pods maturing on the vine though…some of which have been on the vine almost a year. Clare thinks it’s because of the amount of vog (volcanic haze created by the volcano) that’s been generated recently. She’s also tried incorporating some of the techniques in the Vanilla Growing Manual from Venui Vanilla (speaking of which, I ordered a copy about a month ago, so hopefully it arrives soon). Clare was also kind enough to share her curing methods with me, which are typical to the Bourbon style (i.e., blanching, sunning, sweating). The beans were coming along nicely from what I could tell. The amount she has available for sale is limited, so if anyone was thinking about ordering some, they should contact her soon. Maybe when her vines begin flowering, I’ll try and pay her a visit. I attended HVC’s lunch and tour event among a small group of “tourists”. We were served a nice lunch with each element incorporating some form of vanilla. Our host for the day was Dave, one of the small number of employees on the farm. We learned about the Redenkopp family through a video and also had a quick demonstration about making extract. I was told that they produce only about 500 lbs. per year, but due to a recent outbreak of some disease, their entire plant stock had to be replaced from Costa Rican material. Their vines were in the early stages of growth and they don’t expect any beans until at least 2010. Their growing medium of choice is CHC (coconut husk chips) imported from Sri Lanka (I think). Whatever beans they are currently selling is from older stock. I believe they had another growing area apart from what we were shown. That’s what I can recall right now…if you had specific questions just let me know. Thanks for the detailed report. Reader reports are always welcome, just share them through the contact form. 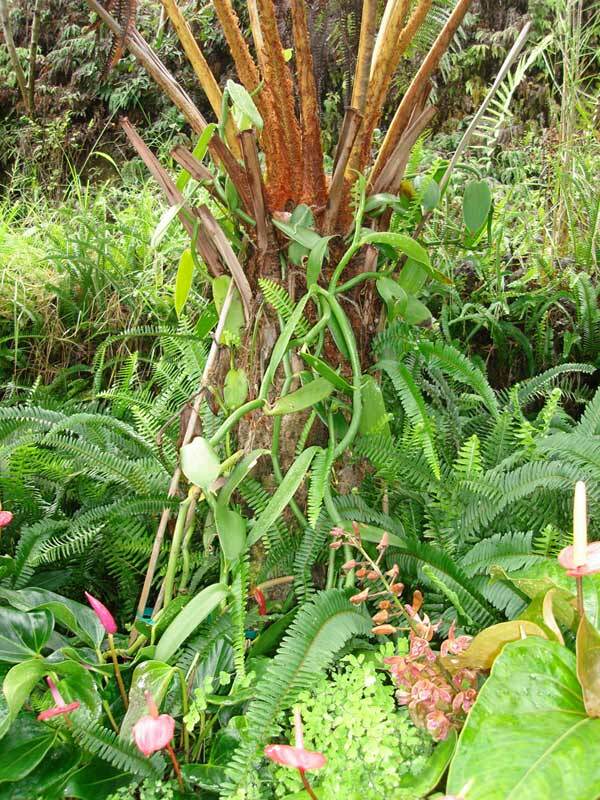 I know Jim (also did the lunch tour) and I will know Clare soon (she informed me she is done w/vanilla that her vines needed to be cut back and I am starting a vanilla project on (Captain Cook/Honaunau area)7th! I will be looking for any and all networking help I can get I am working w/the uoh and the usda agincubator programs for funding any suggestions on Local ag assistance on Kona?anyone?